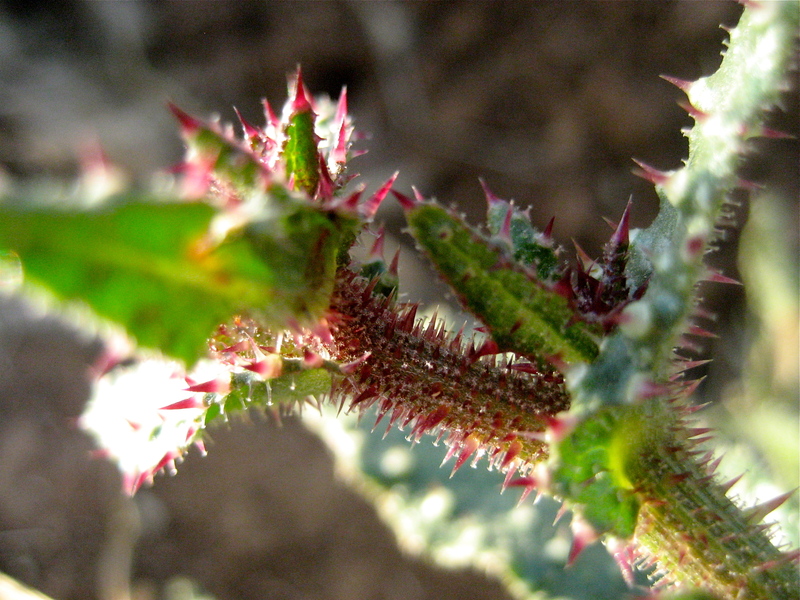 What danger erupted nearby to cause this weed to adapt such delicious looking yet dangerous candy thorns? Perhaps there was an alien child who deigned to feast on weeds, crushing them in his greedy mouth, and so, to protect their species, this weed’s forefathers grew delicious looking poisoned spears. The weed drew the predator in only to make them regret ever having visited. Perhaps there was not an alien child, but a greedy flock of birds who, attracted to this particular weedy treat, became offended when they spied red. One can never be too sure about the plottings of weeds for they certainly stick to their own agendas and deign to care not what others think. Our job is to appreciate the power and inventiveness of weeds. Indeed I do.